But, there’s a twist… you get to choose your own birds to put in the slingshot. Choose wisely, though, or you might end up with some scrambled eggs. There is also a new Destruct-O-Meter that you can fill up to earn extra birds. The possible outcomes are much more numerous now with some of these added features. The game has always had this little quirky feel to it, but now there are even more crazy plants and decorations to make it all the more exciting. You can even use spells, including Blizzards, Hot Chilis, and Golden Ducks. For those familiar with the previous episodes, it will be good news to know that the Mighty Eagle has made a return, and he is wanting some sardines! There is even an international arena where you can test yourself against others around the world to see who the best bird-slinger of them all is! 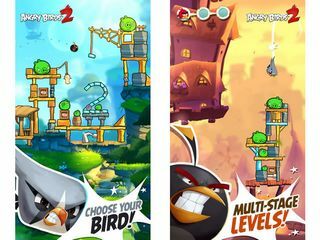 The game is free to download and play, but for the serious Angry Birder, there are some available in-game purchases you can make to improve gameplay experience. When you play the first time, you have to make a download, so that you can play offline. From there, you may need to log online every so often for updates. 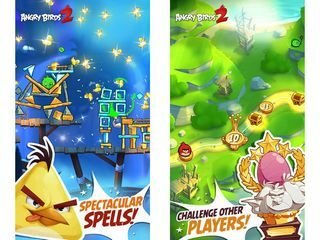 This is Angry Birds 2 review. Download this game here.